Looking at it from different angles, everything indicates that Cuba’s purportedly socialist (or centrally planned) economy stands today at the end of a very long line. The Cuban government has reached a point at which it will have to get serious about the country’s economy once and for all. In the last few years the severity of the economic situation has been frequently recognized by Raúl Castro, indicating explicitly that without a significant improvement of the economy’s productive capacity the socialist revolution will no longer be sustainable. One cannot help but think that the spectrum of the collapse of the Soviet Union and the entire socialist bloc probably has been haunting him since its occurrence, but now more than ever. The crisis was reflected, though not in detail, in the recently-held VI Congress of the Cuban Communist Party (CCP) and its economic guidelines or Lineamientos (2011). Cuba’s chronic dependence on external subsidies suggests that its economy is insolvent but the causes of such straits are not thoroughly appreciated by many observers of Cuban affairs, and even less by the general public, inside and outside the island. Yet it is not possible to fully understand the country’s economic crisis (in fact, a 50–year old crisis) ignoring the string of events that have affected all and every single aspect of the Cuban economy during the last five decades. To understand it, it is necessary to examine the economy not only at the macro or aggregate level, but also through a microscope, i.e., at the level of the socialist enterprise in all sectors of economic activity. In the Cuban case, macroeconomic analysis, even when performed with faulty and unreliable data, does show the economic regression of the country under Fidel Castro’s rule, although it does not explain the wide range of causes of the economic debacle. Cuba’s economic crisis is not a case of systematic mismanagement by an incompetent government that was supposed to be concerned with the economic health of the country. Rather, it is a result of policies by a government that neglected economic affairs profoundly disrupting and irreversibly damaging an economic system that evolved for four and a half centuries and had reached a certain capacity and level of efficiency in 1959. The available quantitative data from government sources are neither sufficient nor reliable enough to describe the depth and extent of this disruption, as discussed by Sanguinetty (2009). But even if sufficient quantitative data were available and reliable, a careful qualitative or institutional analysis would be indispensable to produce an accurate assessment of an economy that has suffered an avalanche of incoherent structural changes inflicted primarily by government decisions. In this paper I try to provide some elements of such assessment hoping to contribute to a better understanding of the causes of the current crisis and the dilemmas a government faces, now that it seems committed to improve the current conditions while avoiding the concomitant political risks and costs. The roots of Cuba’s current crisis were planted at the very beginning of the revolutionary process, as political considerations consistently took precedence over economic ones. Such roots developed in the name of socialism. In reality, they were intended to serve an economically unsustainable political agenda that was never made explicit by Fidel Castro after 1959 when he became in charge of virtually everything in the Cuban government. Since then, the public record repeatedly shows how Fidel Castro’s attention appears to have been focused on political issues in order to: (1) consolidate his personal grip on power in Cuba; (2) project his influence to other countries; and (3) become a renowned world leader by playing the card of anti-Americanism. He greatly succeeded on points 1 and 3, while making significant yet incomplete gains on point 2. The evidence that neither the Cuban economy nor its development was a priority in Castro’s agenda is abundant, albeit fragmented, scattered, and badly documented. Unfortunately, most analysts have failed to recognize such an unusual condition despite the extensive research efforts that have been carried out for half a century. The first serious signal of neglect of economic issues became apparent during Castro’s unofficial visit to the United States in April 1959. At the time, Castro’s entourage included a team of prestigious and competent Cuban economists that was supposed to hold a series of meetings in Washington, D.C., with officials of the International Monetary Fund, the World Bank, the International Finance Corporation, the Export-Import Bank of the United States, and the U.S. Treasury Department. Surprisingly, Castro himself gave orders to cancel all the meetings before the plane landed in the United States territory, leaving the members of his delegation with nothing to do during the trip, as reported by López-Fresquet (1966). The original objective of the meetings was to start negotiations with the named organizations to find ways to alleviate the critical financial situation of the country, as its international reserves had been depleted by the previous government and Cuba needed some loans to stabilize its balance of payments. In fact, the Cuban peso was already overvalued at the time as the central bank artificially kept it pegged to the U.S. dollar under a newly-implemented exchange control regime. But at some point during the trip, Castro thought that he did not want to appear as the traditional Latin American leader coming to the United States to ask for economic aid.2 It was an early signal that political considerations would be lexicographically preferred to economic factors. There would be no tradeoffs between political and economic variables. The performance of Castro’s administration would quickly demonstrate that there would be no trade-offs between the needs of the Cuban economy and its people’s aspirations, and the political and international goals of the new leader. The promises about new economic prosperity during the brief honeymoon of early 1959 would be utterly forgotten. Many other instances of the economy’s subordinate role may be cited. The sweeping expropriations of the mid-1960s, for example, destroyed the economic base of those individuals who were perceived by Castro as his future enemies, regardless of the economic consequences for the country, while the frequent mass mobilizations disrupted all forms of economic activity. Mass mobilizations (militia, literacy campaigns, public rallies) were well-conceived political exercises to organize Cubans around a central government command which monopolized virtually all forms of organization in the country. Civil society, already weak, quickly disappeared and so did the private sector within the economy, the independent judiciary, the free media, and all political parties.3 With regard to the three-week nation-wide militia mobilization involving millions of workers launched on December 31st of 1960 (the day chosen to preclude any spontaneous and independent celebration of the New Year 1961), even Ernesto Guevara publicly complained about the enormous cost to the Cuban economy of such lengthy campaign, but his rare and apparently insubordinate utterance was unnoticed and ineffective. Guevara was showing at that time to be more concerned with the Cuban economy than Fidel Castro. I believe that this was subtle but significant evidence that both men had different views and expectations about what kind of socialism would prevail in the country. Perhaps the most significant yet unrecognized instance of the little regard Fidel Castro had for the economy became evident (but not widely known) in 1961 when the Cuban government de facto abandoned—without any official announcement or explanation—the Quadrennial Economic Plan (Plan Cuatrienal) 1962–1965 even before its formal launching, scheduled for January 1, 1962. That plan had been formulated and coordinated by the Central Planning Board (Junta Central de Planificación or JUCEPLAN), with technical assistance from economists loaned to Cuba by Central European socialist countries and by Latin American economists hired by the Cuban government as consultants or advisors. That year had been officially declared with much fanfare “The Year of Planning,” and considered an essential step towards building a socialist economy based on central planning. Yet the Cuban government did not show much concern about the many requirements for a coherent formulation of the Plan, among them a sound statistical data base, and sufficient knowledge about central planning. There was no central statistical base, especially regarding the private economy and its performance previous to 1959. The productive memory of enterprises, developed when they were private, was erased by the expropriations of 1960s and the replacement of the old managers—many of whom had left the country and gone into exile—by generally incompetent revolutionary loyalists. The country was not prepared for central planning and the top government officials were not aware of these insufficiencies or simply underestimated its consequences. Nevertheless, the formulation of the Plan was undertaken, but it had to be abandoned after completion and before it was launched because the figures generated by the state enterprises, partially consolidated by the corresponding ministries, and finally aggregated by JUCEPLAN, were not reliable and showed glaring incompatibilities. The figures reflected volumes of production, investment and consumption; levels of employment; imports and exports, etc., that were unrealistic and internally inconsistent. The weak statistical base caused a few comical instances of incoherence, such as the case when a single government agency “planned” an annual total demand of toilet paper that surpassed the total production for the entire country. It had become apparent that the Plan’s targets were not simply unrealistic but utterly inadequate and unsustainable, forcing the economic authorities to forfeit a development plan that could not be executed. The massive expropriations of enterprises in the midsixties forced a newly hypertrophied state sector to improvise management systems and practices aimed at avoiding at all costs the collapse of the Cuban productive system. The first measure was to shift all workers left unemployed by closed enterprises into those which remained open. An example of efforts to cope with the new changes was in 1963 when the Ministry of Industry was forced to conduct surveys to gather household data about garment and shoe sizes to guide manufacturing plans by enterprises the government had confiscated. But despite the efforts to avoid a complete collapse of the enterprises’ economic activity, the transfer of private to socialist ownership was so dominated by political and security concerns, that efficiency and productivity considerations were always secondary. It was the beginning of the managerial disintegration of Cuban enterprises, a condition that was never taken into account explicitly by the planning authorities. To make things worse, Ernesto Guevara, appointed President of the Cuban National Bank in November 1959, did away with the rudimentary national accounts system that the Cuban National Bank developed and published annually from 1950 to 1959. This happened in early in 1960, when Guevara refused to accept that the preliminary estimates of growth of Cuban national income for 1959 showed a meager growth of only one percent.4 The Cuban government did not publish national account data again until the 1970s. One can only wonder what kind of government, especially a highly centralized one, could operate effectively for such a long period of time without the most basic statistical information about its economy, and what kind of economic decisions could have been made with almost zero visibility. In this regard it must be noted that for decades, Fidel Castro could go on talking for hours in his famously lengthy speeches without ever referring to the Cuban Gross Domestic Product or some of its basic aggregates such as consumption, investment or the level of employment or prices. His public references to the Cuban economy were focused on specific sectors, never on the economy at large, based on physical measurements—tons of sugar produced or hectares of land planted—and never in monetary terms. These are additional symptoms that the country’s economic performance was not a top concern for Fidel Castro. Moreover, Castro’s reluctance to mention values in money terms were in my view an indication of his misunderstanding of Marxian economics, and his fear that recognizing what he considered capitalist or “bourgeois” concepts would send the wrong message to the public and to the world regarding his rhetorical commitment to build a socialist society in Cuba. Despite the existence of JUCEPLAN since 1960 and the fact that the agency was directly managed by President Osvaldo Dorticós from 1964, acting simultaneously as Minister of Economy, which empowered it in theory to allocate all consumption and investment goods, there never was an attempt to reformulate the four-year plan and early on the country’s economy started suffering from a lack of coherent direction. Instead of the typically socialist central planning agency, JUCEPLAN operated with annual plans that were in fact attempts to keep some order in the economy through the budget by allowing the state enterprises to remain open while letting their workers continue receiving salaries regardless of profitability, levels of production or productivity. This started a process of organic and managerial decomposition of virtually all enterprises which remained in operation after the nationalization wave of 1960. As they lost their corporate governance and financial management systems, along with functions like human resources administration, inventory and asset management, etc., in line with losing all of their autonomy to deal with suppliers and labor and capital markets, enterprises were gradually transformed into rudimentary shops, presumably receiving guidelines (“directivas”) from their corresponding ministries. In the process, these enterprises lost another element of their productive and managerial memory: their ability to deal with a price system ruled by demand and supply forces in product and factor markets. Prices and salaries were arbitrarily fixed by bureaucrats, some times even by Castro himself, and besides losing the capability to read market signals, Cuban enterprises lost their capabilities to make autonomous decisions and operate efficiently. Such reductions in capabilities were further accentuated by the advent of a new cohort of managers most of whom had very little experience, if any, to perform their duties properly. Political allegiance to Fidel Castro was the main qualification for the job. Meanwhile, the economy at large suffered under an already overwhelmed government administration loaded with innumerable state enterprises, managed by incompetent executives (or just care-takers of government assets and workers), that evolved progressively into forms of economic organization that became increasingly dysfunctional and inefficient, while losing installed capacities for lack of maintenance, skilled labor, spare parts and supplies. Since enterprises lost all visibility of profits (or loses) as a measure of economic efficiency, most became insolvent, forcing the National Bank to subsidize them.7 As aggregate demand for goods and services consistently exceeded aggregate supply, the Bank had to print money to cover costs, debasing the Cuban peso and in so doing reducing the purchasing power of workers’ salaries and deepening the lack of incentives for managers and workers to work hard and efficiently. 8 This cumulative process rapidly advanced like the metastasis in a cancer and rendered the country insolvent as a whole, thus requiring for the economy to be heavily subsidized externally, although this was not sufficient to stop the gradual sinking of the productive system inherited by the revolution. The most massive and dramatic evidence of this process is the quasi-disappearance of the internationally relevant Cuban sugar industry. Over the years, Cuba’s authorities developed an addiction to external subsidies and loans, which were mainly extended by the Soviet Union until 1989. From the early 1960s JUCEPLAN was already estimating Cuba’s gap between aggregate demand and aggregate supply a year in advance, to provide the country’s top authorities with a base on which to negotiate the level of external aid needed in the following year. This process continued every year until the collapse of the Soviet Union, only to be replaced by new subsidies from the Venezuelan government under the presidency of Hugo Chávez at the end of the 1990s, and other forms of subsidies as, for example, the dollar remittances of Cubans living abroad. Fidel Castro’s economic policy has not only been incoherent but haphazard and wildly improvised. A study of his speeches would lead anyone to conclude that his stated policies were basically irrational if we assume that the official strategy was focused on the economy. I think, however, that the actual policies, when taken as a whole, were not precisely irrational if we believe that Fidel Castro’s goals were essentially political, for which he needed to: (1) use whatever resources he could extract from the economy he had de facto “privatized,” and then (2) use external resources to fill the gap between what his political agenda required (e.g., funding guerrillas in Latin America and a military presence in Africa) and what Cubans could produce. Granted, Castro’s disorganized, unexpected and out-of-plan interventions in the economy that he started treating as his own can be seen as irrational if considered under strict economic criteria. As I stated before, Fidel Castro seems to have taken the economy for granted, perhaps his major mistake as head of government, assuming that the newly socialized enterprises would keep operating as if nothing happened, unaware that the enormous trauma they suffered would irreversibly damage their productive capacity. Let us return to what happened after the Four-year Plan was silently abandoned. Following the massive socialization of large enterprises, national and foreign, of 1960, plus the same treatment of medium and small enterprises, mostly Cuban, in 1961 and 1962, the government faced the problem of how to avoid a dangerous increase in unemployment. As a result of the expropriations and the insertion of badly understood Marxist principles in the society entire sectors of economic activity were eliminated. Typical examples were the financial sector (banks, insurance companies, etc. ), most service industries (law offices, advertising, publicists, media, etc. ), the commerce sector (retail, wholesale, distribution and transportation systems, etc. ), among others. All those employees who became redundant and did not migrate were re-employed in existing enterprises, thus swelling payrolls with unnecessary workers and accelerating the growth of redundant labor. This nurtured the illusion of full employment, though in effect it was disguised unemployment. Payrolls continued swelling as population growth expanded the supply of labor. In 1962, the main objective of the official economic policy appeared to be the industrialization of the country, breaking the heavy dependence on the sugar industry by promoting an import substitution strategy. The champion of this process was Ernesto Guevara. In 1963, Cuba obtained the lowest sugar harvest in many years. But the country was taken aback in 1964 when Fidel Castro shifted 180 degrees and announced that a new goal for the Cuban economy was to produce a record sugar harvest of 10 million tons in 1970. This announcement took everyone by surprise at JUCEPLAN and other government agencies, as there had not been any previous preparation or feasibility study to analyze the costs and benefits of such an ambitious goal. Politically incorrect expressions of disapproval by members of the Communist Youth were heard in the University of Havana, disappointed about Cuba returning to the old trilogy of sugar, coffee and tobacco instead of industrialization. Castro’s marching orders came virtually overnight. The economic or even political rationale of this radical policy change is still open to debate. Meanwhile, the industrialization plans championed by Guevara and inspired in the traditional Stalinist preference for the development of heavy industry at the expense of light industry (mainly consumption goods) were also surreptitiously abandoned, despite the fact that Cuba had already purchased—mostly on credit—scores of turn-key manufacturing plants valued at hundreds of millions of dollars. Only a few seemed to have prospered or even survived. Many of these plants purchased by Guevara were never installed, and the few that did operated at low levels of efficiency. But several developments were taking place simultaneously in the Cuban economy. After the massive expropriations of 1960 and 1961, enterprises lost most of their management and technical personnel through heavy migration flows. Such skilled personnel were mostly replaced with unqualified individuals, especially at the management level but also at the level of technicians and operators. This became apparent by the collapse of production and productivity levels in many industries and farms, compounding the problem of scarcity. Productivity levels, either labor productivity or total factor productivity, decreased significantly. Along with the loss of qualified personnel, enterprises suffered from lack of spare parts and supplies, not to mention a sense of direction within what was supposed to be a centrally planned economic system. Another grave complication was the lack of coordination or synchronization of supplies that plagued every enterprise in the country. The inter-sectoral (input-output) relations of the economy collapsed; enterprises had considerable trouble receiving supplies on time, in the required amounts and with the required specifications, a situation that caused long periods of low production or no production at all. These deficiencies working together reduced further the levels of production and productivity, as workers continued to be paid regardless whether their factories or farms were idle or not producing at full capacity. Meanwhile low production levels reduced the investment capacity of the country making it insufficient to create new employment. At the same time, the rise in the years of schooling available to Cuban youth delayed their entry into the labor force. After all, it is easier and less expensive to educate than to create jobs, but sooner or later the new graduates had to be “employed” to maintain the official promise that the revolution eliminated unemployment, but under the vigilant eye of the state, while keeping them artificially busy and out of trouble, politically and otherwise. Obviously, after fifty years, elementary economics helps us conclude that this systematic swelling of payrolls would eventually lead to: (1) the debasement of the level of salaries and wages, as (2) the levels of productivity fell continuously, causing (3) lower levels of production, lowering (4) the levels of personal consumption, which (5) lowered further the standard of living of the population. To a great extent by omission, but also by commission, Fidel Castro created a distorted economic system whose main purpose was to serve his political agenda. As a result, the economy that Raúl Castro inherited from his brother is overwhelmed by a network of interlocking distortions and anomalies that even if he and his colleagues in the Cuban Communist Party could understand, they would have considerable trouble in transforming into a more efficient productive system. Among the most critical distortions of the economy are those affecting the prices of all goods and services, including the prices of the factors of production, labor, capital, and land, in the corresponding forms of salaries and wages, interest, and rent. Price distortions appear when a major force intervenes in competitive markets, not allowing prices to freely reach levels of equilibrium generally determined by supply (representing production capabilities) and demand (mostly representing consumer preferences and investment decisions). Such distortions started with the nationalization of private enterprises and continued with the freeze of consumer and investment goods prices, but were consolidated by the introduction of a central planning system that fixed all prices as required by the annual budgets. The problem was that all those prices had resulted from supply-demand equilibrium conditions generated by relatively free competitive markets. Nevertheless, as a result of the upheaval created by the rapid avalanche of political measures such as the nationalizations, severe import restrictions, and the exodus of significant proportions of the stock of human capital, the supply of practically all goods and services contracted, while their demand expanded rapidly while there was no price flexibility mechanism to reach equilibrium. The old absolute and relative prices were already obsolete. In a normal market economy, where sellers and buyers are free to establish the prices of goods and services based on their personal interests and capabilities, prices are signals that indicate to the economic actors what and how much to produce and to purchase. In any economy, shortly after prices are fixed by government decree, imbalances between supply and demand appear overnight, a phenomenon that quickly becomes apparent in the widespread development of black markets, where transactions take place generally at much higher price levels than the previously predominant ones. This is exactly what happened in Cuba starting in 1961, becoming more acute in 1962 and continuing until recently, when some partial market instruments have been allowed by the government in an urgent search for stable equilibrium. This is one of the roots of the many problems Raúl Castro faces: the challenge of how to transform a monstrously disfigured and bankrupt economy into a solvent one, which will not require continuous injections of foreign aid and can develop a minimum capacity to grow in a sustainable way so it could satisfy the basic needs of the population. With the uncertainty around the Venezuelan economy and the latest news about Hugo Chávez’s health, the quest for economic independence has grown more urgent. After the disappearance of the Soviet subsidies in the 1990s, the Cuban government was forced to rapidly open the door to foreign investment, international tourism, and dollar remittances from Cubans living abroad. All this required the creation of new enterprises that would operate with foreign exchange and could not afford the shoddy management styles of the typical state enterprise in Cuba. Such enterprises were managed by military personnel who appeared to be among the very few qualified to manage them with a certain level of organization and discipline. After all, military and security affairs were always taken very seriously by Fidel Castro and the crisis that followed the collapse of the Soviet Union forced him to reluctantly take economic issues seriously too, even if merely for survival reasons. These enterprises in fact created a degree of solvency although only for a significant yet relatively small sector of the economy. Cuba needs to become solvent now and for this Raúl Castro needs to increase the number of solvent enterprises even if he has to implement reforms that are not palatable to either Fidel Castro or to other CCP hardliners. Those reform measures are: (1) allow the emergence of small private enterprises to absorb the redundant labor of the state sector; and (2) introduce reforms at the state enterprise level that will make them produce at higher levels of productivity. These are in fact the general objectives of the Lineamientos recently issued by Cuba’s only legally allowed party. Cuba’s macroeconomic solvency requires that its enterprises be solvent, for which productive efficiency is a sine qua non. But in the Cuban case, macroeconomic policy cannot achieve overall solvency by decree. The role of macroeconomic policy is to raise the degrees of freedom under which the enterprises can operate at higher levels of productivity by lifting the multiple constrains binding the management of productive activities, and allowing the enterprises to create worker incentives necessary to become efficient. Total Factor Productivity depends on many factors, especially workers’ attitudes and motivation, together with their qualifications.10 Machinery and other physical assets in a production process can function automatically, but workers do not. The intensity of workers’ incentives depends on the degrees of freedom they have as workers in the production front, but also as consumers, to choose where and how to produce, what to consume, how much they earn, where to live, etc. And here precisely is where Raúl Castro’s dilemma lies: in the trade-off between efficiency and control: efficiency requires workers’ and citizens’ freedom to choose as an incentive to work hard and be efficient, while political control to avoid political instability requires constraining workers’ and consumers’ behavior. It is safe to assume that neither Raúl Castro, nor the hardliners within the CCP, will promote or support radical reforms. That is why a reading of the Lineamientos signals how cautiously they are approaching reforms, with all kinds of caveats and restrictions, afraid of losing political control at any step. But they know that the current economic situation of the country is precarious and probably not sustainable for much longer, requiring gains in production and productivity (as long as they cannot count on indefinite external subsidies or a miracle). Thus a compromise policy of minimalist reforms will probably be the most acceptable to the different factions within the government to solve their conundrum: obtain sufficient gains in efficiency to reach solvency by creating a subsistence economy. Such an economy is, by definition, less vulnerable to external shocks and can become stable, but does not grow. Raúl Castro can buy some political stability but at the price of secular economic stagnation. Under a subsistence economy, Cubans will be too busy making ends meet to have enough time to dedicate to political activities, at least for a while. Once this new equilibrium is reached, and Cubans learn how to operate within this economy, new aspirations may eventually arise and by that time more profound economic reforms may become politically feasible, perhaps under a more promising post-Castro era. But will it work? Can that strategy benefit enough Cubans in time to avoid political unrest before the Castro era is closed? Will Cubans demand something more significant than marginal or subsistence economic benefits, such as political freedoms and a more promising future? Raúl Castro’s dilemma can be conceptualized as a cooperative game of strategy between two major players: the Cuban government and the Cuban population. In a static framework, the government is trying to minimize the increase in the degrees of freedom granted to the people. This is implemented by strictly fine-tuning shifts in the economic and political constraints. The Cuban people, on the other hand, can be expected to maximize what they can do with their newly enlarged, yet still constrained, choice sets as workers, entrepreneurs, and consumers. This combination of forces is similar to a Prisoners’ Dilemma and makes one think of a possible Nash equilibrium if a stable solution can be reached.11 Nevertheless, the Cuban people at large might not behave as only one player, but as at least two—those who think they can benefit from the newly-relaxed constraints and those who either do not see its advantages or believe that the new degrees of freedom granted by the government should go farther and be more comprehensive. As we write, the stream of popular protests taking place in Cuba suggests that we might be facing a more complex and evolutionary game, whose most likely path is impossible to predict. Under such circumstances one thing that can be predicted with a reasonable degree of certainty is that the Cuban society as a whole has reached a point at which the secular stagnation, at the current level of production, is no longer tenable. 1. Fidel Castro expressed his disappointment (and I believe his misunderstanding) about the economic capabilities of the Soviet Union, especially regarding its agriculture, in a rare string of unpublicized and bizarre personal appearances on the steps of the University of Havana, late at night during the tensest moments of the October 1962 Missiles Crisis. I was among the few dozen students that heard his complaints, never understanding to this day what Castro’s real intentions were. These appearances were not reported in the government- controlled media and Castro never expressed such views in public. 2. Carlos Quijano, a member of the mission, provided me with some of these details. 3. Even the old Cuban communist party, the Partido Socialista Popular PSP), was absorbed by Castro’s embryonic party, Organizaciones Revolucionarias Integradas (ORI), the precursor of a future formally established Cuban Communist Party under Castro’s absolute control. 4. For more details about this bizarre incident see Sanguinetty (1999). 5. Socialist economies and socialist monopolies are intrinsically inefficient. These measures not only added considerably to that inefficiency but also made it impossible to measure efficiency and monitor it at any level. As a result, efficiency started drifting downwards steadily in almost every enterprise owned exclusively by the Cuban state. 6. For a recent review of the many factors that determine productivity levels and their measurement see Syverson (2011). 7. Accounting systems and the elaboration of financial statements became worthless, a process that culminated in 1968 when Cuban accounting schools were closed as money was deemed unnecessary in the communist society Cuba was building. The country has yet to recover from the loss of the accounting profession and discipline, as evidenced by a recent interview with Lina Pedraza, Minister of Finances and Prices, cited by Rendón (2011). 8. 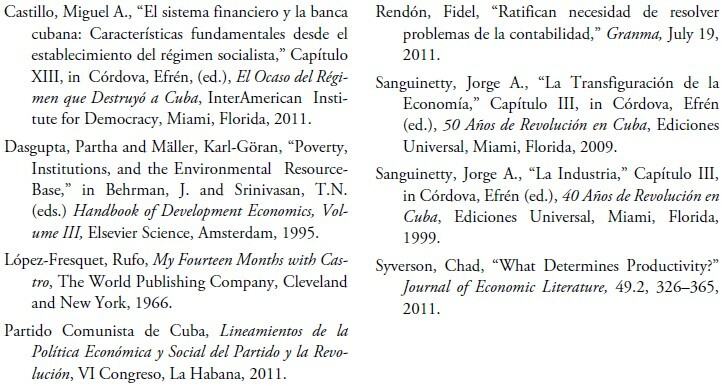 For an analysis of Cuban financial system see Castillo (2011). 9. It can be argued that the government installed the rationing system as a control instrument of the citizens, as the government required households and their members to be registered in given retail establishments. Regardless whether this was a premeditated reason, the rationing represented ex post facto an effective means of citizen control by the state. 11. For a reference see Dasgupta and Mäller (1995), pp. 2439–2441. Jorge A. Sanguinetty, Ph.D. in Economics, worked in economic planning in Cuba in the 1960s. He is the author of Cuba, Realidad y Destino: Presente y Futuro de la Economía y la Realidad Cubanas, and numerous papers and articles on the Cuban economy.